Saturday was Diwali. 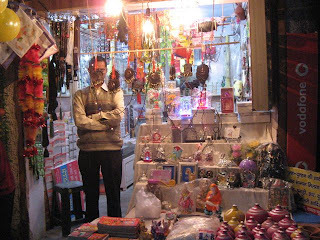 We wanted to go into the bazaar to see all the shops lit up and decorated. My memory from doing that many years ago was that kids were throwing firecrackers around, making walking quite unpleasant. But we decided to go anyway, and had no problems. We went just as it turned dark; I suspect it got a bit wilder as the evening went on. We could hear many firecrackers going off late into the night. 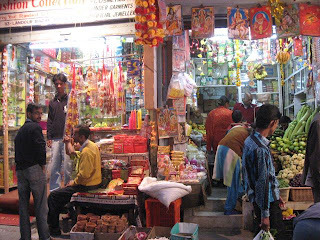 Major shopping goes on at Diwali; the appliance stores were busy selling TVs, washing machines, and other paraphernalia of modern life. Many people have new shoes and clothing. 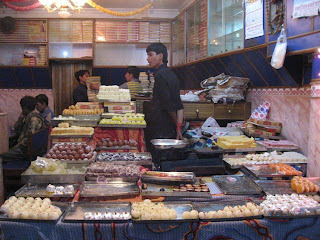 Sweet shops make an enormous amount of sweets, including some special ones just for this time of year. 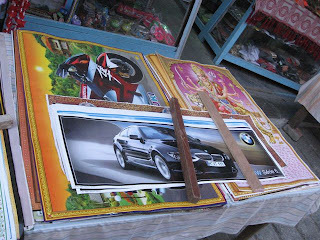 Posters for sale, including the new BMW 6 series!